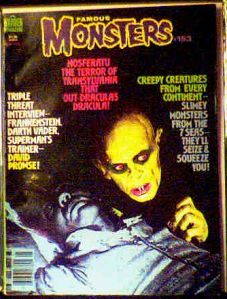 May 1979 issue of FM with cover article on the new Nosferatu movie starring Klaus Kinski. Also has interview with David Prowse of Star Wars. Nosferatu was the remake of the 1922 silent classic, which was based on Dracula. The names and locations had to be changed because Bram Stoker's wife was suing the producers for copyright infringement. Website design and hosting by Sohodojo Business Services. Item 130 of 466 items displayed in viewer. 0 items in cart.